Lahore: Secretary Sports Punjab Humayun Mazhar Sheikh, on Friday, chaired a high-profile meeting at National Hockey Stadium to review the progress of under-construction sports projects in Punjab. Director General Sports Punjab Usman Anwar briefed him about the various under-progress sports projects in the province. The meeting also reviewed different aspects of 2020 Sports Development Plan. DG SBP Usman Anwar told the meeting that Punjab govt always gave top priority to sports. “SBP, by holding grand Punjab Youth Festival, provided best platform to youth of the country. Millions of youth, so far, have demonstrated their sporting abilities during the last couple of years,” he informed. Usman Anwar further said that the potential players not only showed their talent within the country but also won great applauds beyond the border as well. “Every individual has equal right to participate in all sporting activities and it’s indispensable obligation of SBP to provide all necessary facilities to all sportsmen of the province. Under the Sports Development Plan, every youth will have necessary sports facilities till 2020,” he described. Secretary Sports Punjab Humayun Mazhar Sheikh, on this occasion, admired the vital role and leadership qualities of DG SBP Usman Anwar due to which Punjab athletes clinched several titles in various games during the last couple of years. “SBP is playing significant role in the promotion of sports in the country. The sports activities always proved crucial in the progress of a society,” he added. He expressed his hope that SBP will continue to hold grand sports events and play its part for the progress of games and other healthy activities in the country. “Sports has turned into a useful profession in developed countries. Our youth must come forward and show the world their skills in their respective fields,” he added. 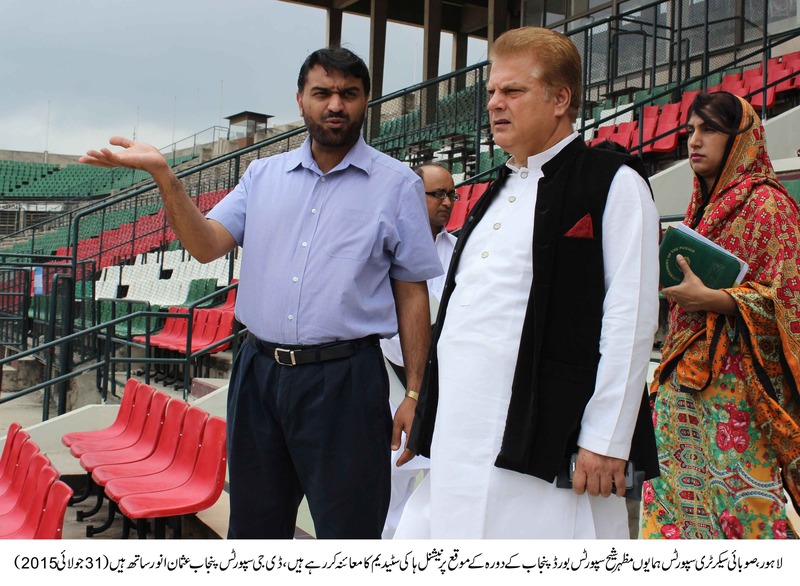 Later, Secretary Sports Punjab visited all the departments of Sports Board Punjab and National Hockey Stadium. He was accompanied by DG SBP Usman Anwar and other top officials of SBP.